Rhine river cruise in Germany. 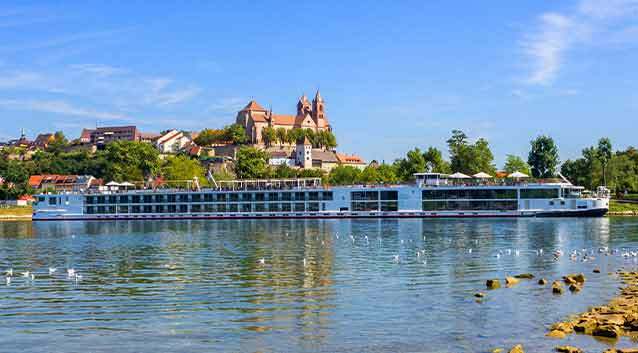 River cruises have been rapidly growing in popularity, and for good reason. It’s a convenient, comfortable way to see iconic destinations and experiencing local culture. Hundreds of new cruise vessels have launched in recent years and expertly curated itineraries are continually sold out during peak seasons. A river cruise is essentially a floating boutique hotel experience—transportation and accommodation in one. If unpacking your bags once with an opportunity to explore multiple cities with history- and culture-rich itineraries appeals to you, a river cruise may be a good vacation fit. As a passenger, you’ll glide past some of the world’s most picturesque landscapes while also covering a lot of ground—literally. There will be plenty of onshore time, so pack good walking shoes and explore the heart of port cities, historical landmarks, art galleries and eat local cuisine. Join daily group excursions that are often leisurely paced—or if you're more of an independent traveler, you can rent a bicycle perhaps, and enjoy solo discoveries. Like ocean cruise lines, river cruise lines differ in style and degrees of luxury. Europeans invented modern river cruising in the 1970s and the industry has gradually spread worldwide. Everything is on a smaller scale. River cruise vessels are smaller—about a tenth the size of an average ocean cruise liner—and are more intimate with a maximum occupancy of 150-200 passengers. Additionally, cabins are smaller but there’s still plenty of room comparable to a small hotel room (you’ll still want to pack light, though). Keep in mind that river cruise vessels are not to be confused with ferry boats—they’re yachts that provide a variety of accommodations that range from no-frills to luxury cabins and spas that compete with 5-star ocean cruise liners and traditional hotels. All-inclusive cruise packages are the norm. Unlike ocean cruises, river cruise packages often include pre- and post-cruise lodging, onshore group tours including expenditures like meals and entrance fees, and pre-paid gratuity in base pricing. Though to get the best rates, cruise lines recommend double occupancy—similar to ocean cruise liners. Local, fresh meals are included. While there won’t be as many onboard food choices, meals are often fresh and locally-sourced en route and highlight local fare. Onboard meals are served at scheduled times, and local entertainment is usually provided during dinner. Most of the entertainment and activities happen onshore. Although you can relax and enjoy the onboard sky deck, pool, library, restaurant, bar and lounge—you won’t have a variety of 24 hour access to food or entertainment as you would on a typical ocean cruise. Things are more curated on a river cruise, for a smaller crowd. And while newer cruise lines are offering more onboard activities, most river cruise lines encourage passengers to join daily guided land excursions, which usually last all afternoon. You won’t see a lot of young children onboard. Most river cruises are enjoyed by older adults since river cruises tend to last an average of 7-14 days, but that’s changing. Disney offers family-oriented Europe river cruises, and top-rated cruise lines like Uniworld Cruises are rapidly attracting younger adults with newly offered experiences that appeal to Millennials’ travel preferences. Without kids and large groups, there’s likely to be greater flexibility. River cruises often dock in a city’s center for the evening, making it easy for passengers to hop off and explore the local scene. And with smaller groups, you’ll be able to connect with other guests in a more intimate setting, which can make it easier to return onboard for departure. River cruise vessels reach waterways and cities that ocean cruise liners can’t. While floating along a river you’ll often have scenic landscapes to enjoy, unlike the open ocean or sea view from a deep water, mass market ship deck. River cruises take passengers to more inland port cities and are often docked in the heart of cities like Budapest, Shanghai and St. Louis. One thing to keep in mind while booking a river cruise is when you go. Rivers need to be at a level for cruise vessels to move smoothly. Seasonal heavy rains can cause high waters, making it difficult for river cruise vessels to pass under bridges; and shallow waters can completely halt waterway travel—both requiring rerouting, and a change in transportation modes and accommodations. We recommend that you ask your cruise line of choice on guidance and insight on this. But, you’re less likely to get motion sickness. Experiencing motion sickness is uncommon on river cruise vessels. River waterways are typically calmer than seas and oceans, and there’s less onboard turbulence—all at a slower speed. With an uptick of river cruise lines offering more itineraries to top inland destinations worldwide, it can be difficult to narrow down your options. We’ve highlighted three of the most popular river cruise regions. Uniworld Cruises, Crystal Getaways, and Avalon Waterways are luxurious and innovative, offering unique itineraries tailored by generational travel preferences. (April - October) Europe river cruises run from early spring to late autumn, but extend through New Year’s Day on both the Rhine and Danube. Summer months are most popular, after potential high waters in springtime and before autumn’s rainy season. Viking River Cruises and Century Cruises both cater to English speakers and offer multiple itinerary options. (April - October) For Yangtze River cruises through China, voyages are usually scheduled from April through October. Late spring and early autumn months are the best months to book, as torrential rains occur in the summertime. (November - February) For Mekong River cruises through Vietnam and Cambodia, voyages are scheduled year-round. But winter months provide cooler temperatures and clearer skies, as rainy season occurs from May through October. Mississippi River cruises are by far the most popular in the U.S. river cruise industry. American Cruise Line and American Queen Steamboats dominate the small U.S. river cruise market. Mississippi River cruises, both Upper and Lower, are most popular. (Year-round) Mississippi River cruises are divided into 3 parts—Upper, Middle and Lower. October through December is peak booking season, as summers in this region are humid and hot. (April - November) For Columbia and Snake River tours, voyages occur year-round. September and October are most popular, as it’s usually cooler and the scenery is more favorable and spring months can be rainy. Careful trip planning is always a good idea. You’ll want to book your river cruise vacation months in advance to secure desired cabin space during peak travel seasons and popular itineraries. When booking far in advance it’s a good idea to consider travel insurance with Trip Cancellation coverage. Many things can happen between the time you book your trip and the start of your vacation that could affect you or your traveling companions and force you to cancel your trip. Travel insurance can help in case of a covered event such as sickness, losing your job, and even flight cancellations due to adverse weather or an airline strike. Other coverages, such as Medical and Dental and Emergency Assistance and Transportation can reimburse you for medical expenses, which can be especially helpful if you are cruising abroad. If a covered event interrupts your trip, travel insurance can help you catch up with your cruise so you don’t miss the whole trip. If your river cruise line offers a travel insurance plan, check to make sure it has what you need and compare prices before selecting the default insurance. Generali Global Assistance offers three travel protection plans, so you can choose the one that best fits your trip and personal needs. Read more on why travel insurance is a smart addition to your river cruise investment.